Learn Windows8 is a free Windows 8 guide app available under the ‘Education’ section of Windows 8 app store. This guide app for Windows 8 gives you easy step-by-step video lessons to learn how to operate Windows 8, its interface, applications, keyboard shortcuts, turning off, installing apps, moving apps, picture passwords, and much more. 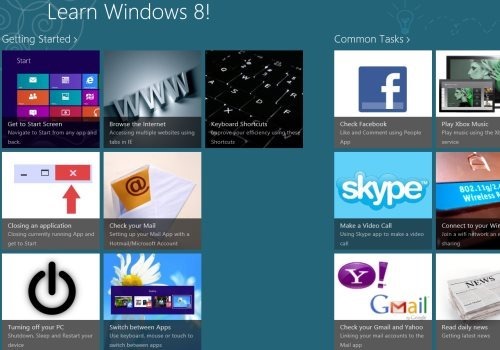 Learn Windows 8 is a must-have app for all those who are new to Windows 8 and for those who want fast access to Windows 8 UI. As you all know, Windows 8 is the latest OS that Microsoft has come up with. Its new, its unique, different from the previous version of Windows and yes.. its complicated to access. Hence, in some or the other way, almost all of you (including me) need such a guidance before getting started with this new and complicated OS. This Windows 8 guide app provides virtual lessons for common tasks such as browsing, listening to music, sending & receiving emails, installing applications, searching, checking stock market, FB, etc. 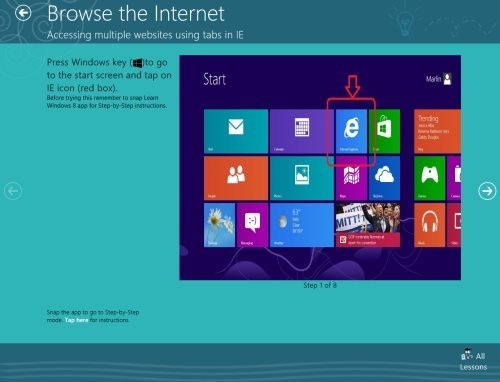 What I really found interesting using this guide Windows 8 app is its column-based tile interface. As you open the app, you will find categories for taking free lessons: Getting started, Common Tasks, Personalize, and Delighters. Each category consists of all the related lessons. You need to click on a tile and watch the short virtual lessons along with reading the text part for better understanding. Let me quickly point out the features of this Windows 8 guide app below. Lets you learn accessing Windows 8 OS via step-by-step video lessons. Guides you with keyboard shortcuts for Windows 8, installing apps, setting picture passwords, turning off the PC, closing an app, and much more. There are categories including Getting started, Common Tasks, Personalize, and Delighters where you will find related lessons under each category. It’s very interesting to learn Windows 8 via this Learn Windows8 app. The app updates periodically and gets you new & interesting lessons. Well.. I loved this guide app for Windows 8 where you can learn lessons related to operating Windows 8. Right from settings passwords for entering Windows 8, to installing apps, to keyboard shortcuts, to listening to music, just everything you can learn here. Thumbs up!! to Learn Window8 app. Also, check out our posts on Travel Guide Apps, and Tour Guide App. Open this given link in IE10. Now, click ‘View in Windows Store’. Soon, it will let you install the app from Windows 8 app store. In short, Learn Windows8 is a good informative Windows 8 guide app where you can get guidance for accessing Windows 8 OS. Go ahead and download Learn Windows8 app in Windows 8 now.